Motorised Valves are used to divert the flow of water from the boiler to (a) the direct hot water cylinder (b) the central heating radiators or (c) both. Motorised Valves are available as either 22mm or 28mm valves, which will be established by that of your pipe work of your home. Motorised Valves can be used with a Central Heating Programmer to provide zone control, which can change temperatures for different rooms at different times. A Two Port Motorised Valve has 2 pipe connections (Inlet and Outlet ports) that permit or block flow between the ports depending on whether it is actuated or not. Flow is permitted when the valve is started (usually when the boiler is on) and blocked when the valve is off. Two Port Valves are only designed to control the flow for hot water or central heating, at one time. Two Port valves may also be referred to as Zone Valves. A Three Port Motorised Valve has 3 ports (one inlet and two outlet) and can divert the water flow to either or both of the outlet ports. This allows one Motorised Valve to control heating and hot water, instead of two separate Two Port Motorised Valves. 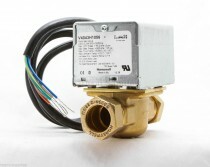 Most Three Port Motorised Valves have a mid position option which allows flow to both circuits simultaneously, but some Diverter Valves allow flow to only one or the other at any one time. Three Port Valves are commonly referred to as Mid-Position Valves.